About a month ago, I made a bet with my friend, Mark Diba. Mark, as you may know, is the world’s foremost expert on the works of DisneyToon Studios, the Disney animation division whose catalog includes the notoriously awful direct-to-video sequels of classic (and sometimes not so classic) Disney animated films. At the time I was raving about the latest entry in the wonderful Fast & Furious series, but Mark was not so convinced. I challenged him to watch at least the first five Fast & Furious movies, and if he remained unimpressed, I would watch and review seven DisneyToon movies of his choosing. 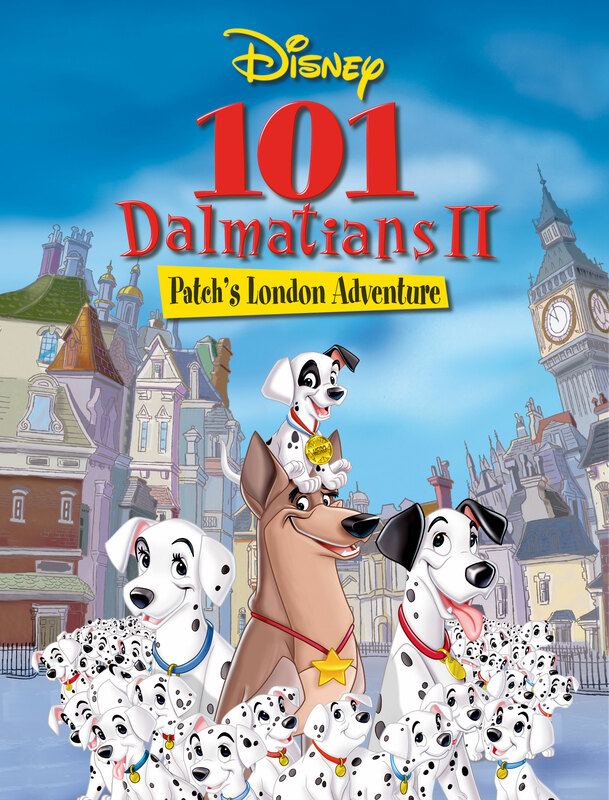 Somehow, because Mark’s brain is broken, I lost the bet, so here we are with the first review: 101 Dalmatians II: Patch’s London Adventure. I’m having trouble figuring out how to review this “movie,” because it isn’t really a movie, it’s a piece of merchandise. It’s a cheaply produced toy meant to pacify children without any real artistic merit. It would be so easy for me to just sit here and take potshots at the many, many lazy things this “movie” does, but that idea runs so counter to what I’m all about when it comes to discussing film. I always try to give the film the benefit of the doubt and approach it on its own terms. Difficult as it may be, I’m going to try to give this “film” more thought than it deserves, possibly more than the filmmakers gave it. 101 Dalmatians II picks up shortly after the original film left off, with Roger and Anita packing up their small London flat in preparation to move to their “dalmatian plantation.” In the midst of all this, Patch, one of the original fifteen puppies is feeling lost amid all of his brothers and sisters. He wants to be a “one-of-a-kind wonder dog” like television hero Thunderbolt, but he feels as though he’s just another face; just one in one hundred and one. On the day of the big move, it turns out Patch’s fears were right! His family does hate him after all and they leave him behind. Since they’re all gone, Patch figures he might as well head down to the set of the Thunderbolt show where they’re holding open auditions for a guest spot on an upcoming episode. There he meets up with his hero, who – surprise! – turns out to be a shallow, self-absorbed jerk, and the two of them proceed to wander around London while his family hangs out in the countryside and pretend not to notice that he’s gone. Also, Cruella de Vil is in the “movie” for no good reason whatsoever. The most glaring issue with this “movie” is that it is completely uninterested in telling its own story or adding anything meaningful as a sequel. They start off going for a sort of pseudo-Home Alone story, but at a certain point the “movie” just gives up and resigns itself to being nothing more than a series of empty callbacks to the original film. Horace and Jasper sneak in to steal the dalmatian puppies and get in a fight with Nanny, because that’s what they do in the original. There’s an extended montage where Patch and Thunderbolt find out about the stolen puppies through the twilight bark even though they’re just down the street. Why? Because there simply must be a twilight bark montage, otherwise how will people know that this is supposed to be like the original? The climax of the “movie” is even centered around a car chase with Cruella because that’s (sort of) how the original movie ended. But, of course, because this is made for kids and kids are idiots, all of the callbacks in this are EXTREME. Horace and Jasper’s conflict with Nanny is now an extended slapstick sequence. The puppies escaping from Horace and Jasper’s hideout now involves using a canvas as a trampoline to escape through a skylight instead of merely sneaking through a hole in the wall. The final chase now has the puppies themselves driving a double decker bus through London. It takes everything from the original film and redoes them in the most painfully obvious and over-the-top ways imaginable. And, you know, maybe that wouldn’t be so bad if there was a point to any of it. Toy Story 2, for example, has similarly heightened callbacks to the original, and “the same but heightened” is sort of the mission statement of Evil Dead II, and both films are widely regarded as being superior to their predecessors. The difference, though, is that those films did that in service of something greater. The callbacks in Toy Story 2 work because they’re married to the new story the movie is trying to tell. Bringing back a version of “deluded” Buzz is a fun callback, but it’s also important to illustrate how much Buzz has grown as a character and how the roles are reversed witch Woody being the one who is lying to himself. As for Evil Dead II, Sam Raimi essentially remakes The Evil Dead as an excuse to let loose and do wild and crazy experiments with camera movements and the blending of horror and comedy. The callbacks in Dalmatians II, though, aren’t that smart, and end up being completely empty and hollow. The most hollow of all the callbacks, though is Cruella de Vil herself. There is no reason for Cruella to be in this “movie;” I’m not even being hyperbolic when I say that she spends the first two-thirds of the “movie” waiting around to make her turn as the villain in the final stretch. There’s a completely arbitrary and inconsequential B-plot that’s woven in with Cruella becoming obsessed with a German artist who paints pictures of spots, and aside from being unbearably awful, it also has no relevance to any other aspect of the “film.” It doesn’t matter to Patch’s story, it doesn’t matter to the dalmatians’ story, hell, it doesn’t even matter to Cruella’s story. It’s not part of any kind of real arc for her character, it’s just an excuse for Cruella to make an appearance 40 minutes before the story needs her. Cruella de Vil – one of the all-time great movie villains – spends most of this “movie” performing throwaway gags. It also weirdly feels closer to the Glenn Close version of the character from the live action films than to the original iconic villain. Aside from being a betrayal of the character, it’s a betrayal of the “film’s” own story. The story, ostensibly, is all about Patch finding his place in the world by emulating his hero only to learn that his hero is a fraud. That story already has a villain, and it’s Thunderbolt’s sidekick, Lil’ Lightning. Patch has self doubt so he seeks out his hero to learn from them, but it turns out his hero is a chump and gets them both into trouble, so Patch has to learn self-confidence and save both himself and his hero. This is such a cliché stock story that it’s unbelievable that they were able to mess it up, but they did because someone decided Cruella de Vil needed to be in this and there needed to be a third-act retread of the original film’s puppynapping plot. It not only distracts from the main purpose of the story, but it also accidentally makes an ugly statement. Patch’s family doesn’t even realize that he’s gone until the puppynapping takes place. By having Patch rescue his family who didn’t even realize he was missing, the “movie” is saying that your value is tied to your ability to perform grand gestures to impress people. Again, the “movie” is going for one of the most cliché themes – the idea that you determine your own self worth – but it screws up even this most basic thing because it was more concerned with making empty callbacks. The underlying issue in all of this is that the people making the “movie” simply didn’t care. This isn’t a real movie, it’s a product designed to make your kids shut up for 70 minutes. On some level it’s patently ridiculous putting this much thought into a “movie” that was never intended to be watched by anyone besides very young children, but on another level, having lazy, poorly crafted children’s entertainment with poorly conceived mixed messages is kind of a huge problem. I’ve mentioned this before, but kids crave stimulation. They want to learn and reach and grow and experience new things and new ideas they haven’t seen before. To treat children like idiots and not put care into the kind of messages you’re putting in front of them is grossly irresponsible. If anything it’s more important for children’s entertainment to be smart and well crafted than it is for adult entertainment, because at least most adults have the capacity to contextualize things in a way children don’t.